Most fans traveling to NHIS didn’t even know that Jimmy Blewett was going to drive the TS Haulers #12 car this weekend. After the race though, there were very few observers who weren’t impressed. Blewett led laps and was one of a few drivers who looked capable of winning even after he dropped back in the draft a few positions. Did Blewett expect to be so strong at NHIS? So what’s next for Blewett and his team now? Nevin George finished 10th at NHIS. That’s impressive. But it’s how his team got to be even in the position to end up there that is even more impressive. George has a valve stem fail in practice and Thursday and blew out a tire. 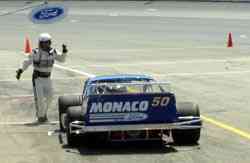 He then hit the wall hard and had heavy damage to his #0 car. Without a backup car, the team rebuilt their primary machine. Apparently, they did a good enough job for a top 10 finish. TC acknowledged that Hirschman helped him get into the lead. “He pushed me through there and that was definitely a help,” Christopher said. Eric Beers also elected not to tuck into behind Coby to try and move to the front. That was a case of handling issues though. Coby asked the Hirschman team for answers after the race and talked about what he learned. In spite of all the drafting and chess games, there were in fact a few good passes and near passes late in the race. The turning point in the NASCAR Whelen Modified Tour race at New Hampshire came with only a handful of laps to go. 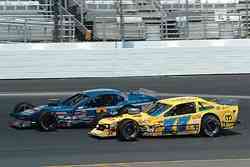 Doug Coby was being pursued for the lead by Ted Christopher. 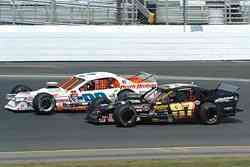 Tony Hirschman lurked behind the two drivers. With drafting so important at the one-mile track, whoever Hirschman decided to pull in behind would likely settle into the lead. Hirschman chose to hang with the #13 of Christopher and despite a last second to pass to try and take the lead from him, the two finished first and second. Coby was left out in the cold and finished fourth. Coby was also surprised because he considers Hirschman an ally in the garage area. But Hirschman maintains that his decision had nothing to do with friendship and everything to do with his own chance of winning. The first started when Coby looked in him mirror and saw TC. “When he got into second I thought, ‘Oh no, Ted’s behind me and that’s not good,” said Coby. Then Coby tried to hold off Christopher. The two zigged and zagged down the frontstretch and TC got the spot. “We were road racing,” said Christopher of the unconventional lines that the two drivers took. Next, it was Hirschman’s turn to try for the lead. Coby felt that he had earned Hirschman’s help at the end of the race. Both by showing that he was worthy of running up front at NHIS and by helping Hirschman earlier in the day. “This is my third really good run here,” said Coby. “I ran Zach’s car last July and we finished 10th with Don King’s car last September, so it amazes me [that nobody would draft with him]. When Tony fell back on the restart, I think that we fell back to eighth maybe worse. We started to catch somebody, I don’t remember who and we pulled out to pass him. I went in behind him and gave him a couple good shots to help him make the pass and then he pulled right up in front of the guy and hung me out to dry. Unfortunately, an engine expired before the race’s laps did and Blewett dropped out of the event. Another pivotal point in the event came earlier in the race, when Chuck Hossfeld lined up to the outside of Christopher on a restart. Hossfeld got a big jump before the green flag and was given a stop and go penalty which pretty much ended his chances of winning. The tire problems weren’t isolated to Lia’s team either. Rick Fuller stayed near the front and flew under the radar screen for most of the 100 lap race at NHIS. He finished sixth. “It was alright,” said Fuller of his day. “It wasn’t bad. With our record here at Loudon, sixth is probably like a win. The Polar Beverages teams has improved their performance in recent races and that has not gone unnoticed. For finishing in 17th-place, Zach Sylvester was pretty happy after the race. It wasn’t because of how he finished though, it was because of how he ran. Was the restart a case of Hossfeld being over anxious or Christopher playing games? Hossfeld recovered from the penalty to finish seventh. Christopher won the race. It wasn’t a hard decision for Alex Hoag and his team to make the trip North to New Hampshire. 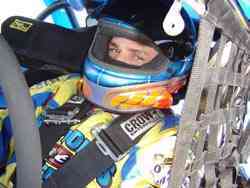 Exposure was the name of the game for the NASCAR Whelen Southern Modified Tour driver. That wasn’t to be though. At the top point of the top 10 was a Christopher (Ted). Meanwhile his twin brother Mike was on the other end of the top 10 in the 10th position. But, he wasn’t very thrilled about it. Jerry Marquis ended up eighth, but considering all that he had to do to get there, he couldn’t have been too disappointed. Having qualifying get rained out and having the field set by points was not a good thing for the Southern invader. The day wasn’t a lose for the #15 team even though they finished much further back than they would have liked. Marquis got caught a lap down, but moved up to the top 10 after making that up. How he got back on the lead lap is something that he is very thankful for. “God bless the lucky dog,” said Marquis referring to the rule where a lapped car can make up a lap on each caution. Donny Lia had one of the quickest cars in testing at New Hampshire International Speedway. He started the race sixth after qualifying was rained out and the field was set by points and he made forward progress early in the race. But tire problems rained on Lia’s day during the 100-lap race and left him with a finish of 14th. Beers got his caution and changed tires, but from their he was off sequence with the rest of the contenders. Beers has been on a roll lately and his first win looks like it could be right around the corner. 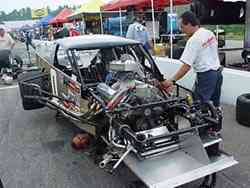 Once again, Doug Coby showed that he is more than capable of winning races on the Modified Tour. He’s been one of the hottest drivers of late in the series and came so close to winning at NHIS before fading to a fourth place finish. He was still able to look on the bright side of his finish after the race. Tyler Haydt had never raced at NHIS before this event. The rookie did exactly what was expected of him though buy staying out of trouble and finishing the race on the lead lap. His 25th-place finish was not flashy, but nobody was mad at him after the race and he gained a ton of experience. So what were Haydt’s impressions of the strange new place where he raced? 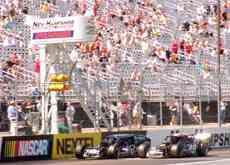 And the fact that NASCAR Nextel Cup and Busch Series teams were watching added to the attraction of racing at NHIS. Defending champion Tony Hirschman finished second at NHIS. It might not have been his ideal finishing position, but it was a solid day and when you are ranked third in points, those days really help the big picture for the season.